As soon as the program outline and budget have been formally approved, execution of the program must be worked out in detail. The plan must start with a set of detailed objectives together with corresponding supporting tasks, complete with target dates, resources required, cost estimate, and method of measuring performance. On the Transit project all of the objectives described above were vigorously pursued. For each item listed, specific tasks were identified, and a method of measurement or evaluation established. The person responsible, target dates, costs and locations were assigned to each task, as the program developed. Municipal and Public Relations has had its own separate section in the regular monthly Executive Summary Progress Reports . As well as monitoring the program internally, public opinion surveys were used extensively to obtain readings on the external success of the program. These were conducted particularly after special events such as local exhibitions, the issue of a new brochure and so on. During construction, the alignment community was recognized as the most important audience. In the 22km of the system, there are 15000 homes within two blocks on either side. All homes within this area were informed by news letter as construction proceeded in each section. "Construction Progress in Your Area" provided residents with information on upcoming utility relocation, foundation excavation, column construction, the night time transportation of bridge beams and their subsequent erection. It gave details of who, how and when. When special permission from City Hall was necessary for construction activities, such information was hand delivered. There have been over 60 issues of the news letter . Each issue went to between 300 and 3000 homes according to the particular location. In addition, a construction "Hot Line" was established and available to receive complaints day and night. It was provided by an answering service after 5pm. However, all calls were promptly dealt with, often with someone arranging to go and see the person concerned at the earliest opportunity to resolve the complaint. The practice worked very well and paid dividends. The PR effort was intensive. Up to 16 alignment tours, 16 speaking engagements and 6 local exhibitions were conducted per month at the peak of construction. Some of the exhibitions were open for several months. Politicians and local representatives were naturally on hand on most of these occasions. 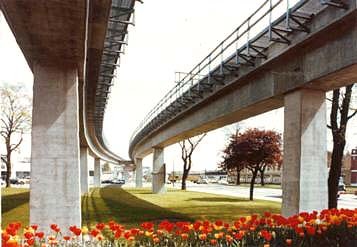 Several events were made the opportunity for special celebration, such as the opening of the demonstration section, the break through in the downtown tunnel section, the erection of the last of the 1074 overhead concrete guide way beams and the energizing of the vehicle control and maintenance center. Recent popularity surveys indicate that the project has the support of 80% of the local population. The success of the program is perhaps reflected in the fact that there have been no major schedule delays or cost overruns resulting from unwarranted interference in project progress. But perhaps the most satisfying evidence is to be seen in the shift of attitude on the part of the local newspapers. Expo's Communication Division conducted opinion or awareness surveys to monitor the results of its efforts. However, to consolidate public interest and commitment as well as being part of its aggressive marketing campaign, one of the most distinctive buildings, Expo Center, was fast tracked to open a year earlier than the main event. This 17 storey high preview pavilion, which includes a 27 meter domed Omnimax Theatre, has provided an exciting foretaste of the 1986 world exposition. It has at last attracted favorable press comment and solidified local public support.